This Environmental Campaign is not just about uniting our 50 States to develop a Green America, this is about uniting the whole world to take responsibility to continue the commitment to reduce the impact on climate change and the environment in order to make our planet safe again. Through sustainable producer Antonio Saillant's presentations worldwide entitled “An Intersection Between Sports, Film, Television and Sustainability” his commitment to reduce the impact of climate change and be on the forefront of sustainable business practices by spreading awareness through social media and all educational platforms about ongoing efforts for climate action plans. 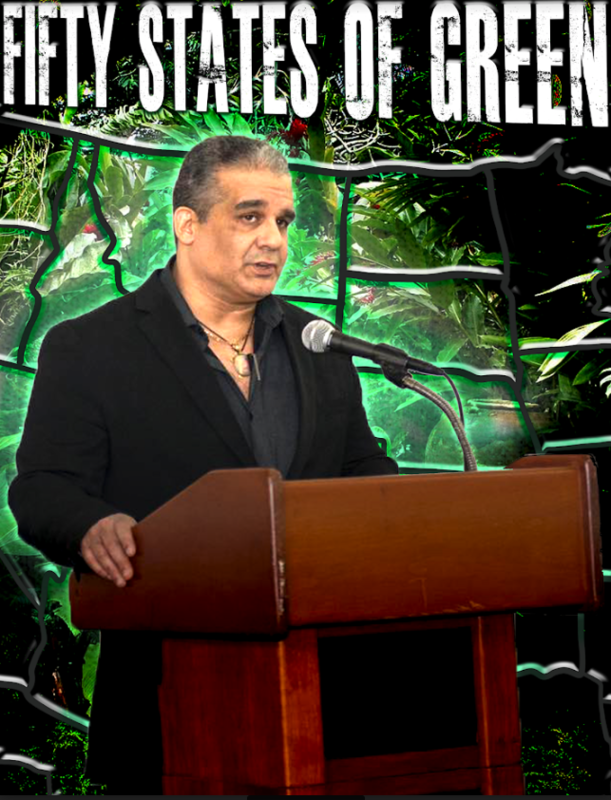 Listen to advocate Antonio Saillant as he gives an emotionally but positive talk detailing his fight for environmental plan in the entertainment world in hopes to spread a movement across the USA and Globally. Green is our future! Our steadfast dedication to the preservation of the environment is to ensure the well being of our planet by uniting people to explore the concept of being sustainable in their everyday lives and to share their experiences of ‘Green Awareness' globally, in hopes to empower, nurture, motivate, and inspire future sustainable leaders. Antonio Saillant is the Chief Executive Officer and Founder of Angel Light Communications, a production company that gives inspired filmmakers the chance to make their dreams into reality. The global climate crisis won't be solved by rhetoric and grand speeches but by hard work and the courage to do what's right. We are proud to be a part of the movement to bring environmental consciousness into entertainment and to the world. Currently we have begun developing on a new kind of film festival, Planet Greenfest. Planet Greenfest mission is to use The Power of Green to Fix the World by producing THE WORLD’S ONLY GREEN SHORT FILM FESTIVAL. This will be a global event and its sole mission is to support and cultivate an eco-friendly new way of filmmaking and getting to the core of being green and thinking green by bringing knowledgeable and creative filmmakers together so we can gain strength and change the world. Sponsored by Red Giant Union, Healing Seekers and EarthKind Energy whom are committed to reduce the environmental impact of the entertainment industry and the world. Expected target date is 2018. We are also exploring the possibilities of collaborating with other companies and film makers from all over the globe. We find that through these positive relationships we are able to build a trusted community of film makers interested in making a difference. "Building for a Better and Cleaner World." Billions of years here, Millions of reasons why.